Steel cut oats could be considered a "power food" because they are an excellent source of protein, soluble and insoluble fiber and select vitamins and minerals. The benefits of steel cut oats exceed the benefits of rolled oats because of the way they are processed. Steel cut oats are dense and chewy as a result of being passed through sharp, steel blades that cut them into thin slices that helps retain more fiber and protein. Steel cut oats, just as any whole oats, make a healthy addition to your regular diet. Steel-cut oats come from the same plant as rolled or instant oats and other oat products. The difference between steel-cut and rolled oats is in their processing. Steel-cut oats are never cooked and start from the whole grain that is then passed through slender blades that cut the oat kernel into thin slices. Rolled or quick oats, prepared the old-fashioned way, are steamed and then rolled. Rolling the oat helps it to cook faster. Steel-cut oats take 15 to 20 minutes to cook. Steel cut oats have 5 g fiber per 1/4 cup dry oats, including 2 g insoluble fiber. 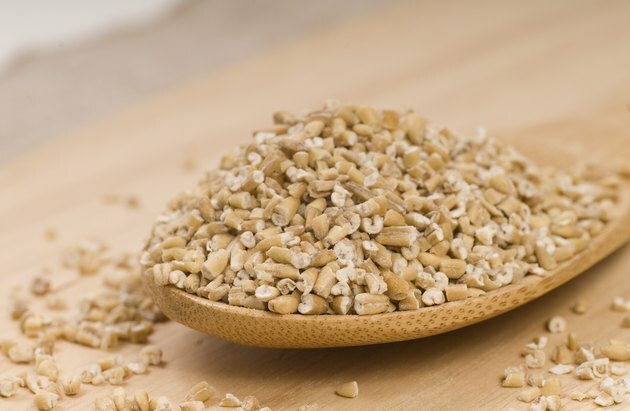 The insoluble fiber in steel oats includes d-beta-glucan which is associated with improved blood sugar levels in diabetes and improved cholesterol levels. Specifically in diabetes, as little as 3 g beta-glucan daily is suggested to slow gastric emptying thus lowering glycemic response to a meal. Its role in lowering the glycemic load of a meal also helps improve cardiac health, based on a 2004 article published in the Journal of the American Medical Association. Steel-cut oats are a good source of protein providing 7 g protein per 1/4 cup serving. The protein in steel-cut oats is complete, containing trace amounts of all the essential amino acids. It is relatively high in glutamic acid and aspartic acid, and low in tryptophan. Steel-cut oats are a whole grain product and as such are naturally good sources of B vitamins and iron. Like most whole grains, you can get 10 percent of the recommended daily allowance for iron in 1/4 cup dry steel-cut oats. Adults consuming the equivalent of 1/2 cup dry oats obtain 20 percent of their iron in this amount. As with other whole grains, steel cut oats are also a good source of B vitamins, providing at least 10 percent of the recommended daily allowance for thiamin, niacin, riboflavin and niacin.